I used Disk Utility to format a drive so that it has two partitions. I'd now like to combine those partitions into a single one. How do I do that? Launch Disk Utility, select the drive that holds these partitions (rather than one of the partitions) and run your eyes over the diagram to the right, noting the name of the partition that appears on the bottom of the layout. Move to the Finder and open that bottom partition. If it has regular old files on it, copy them to the first partition (if they fit). If they don't, find another drive or volume that will hold them (if only temporarily). If the bottom partition is bootable and the top one isn't, clone it to the first one using a tool such as Bombich Software's $40 Carbon Copy Cloner. After ensuring that the files from the bottom partition are safely backed up to the top partition or another volume, return to Disk Utility. Select the bottom partition and click the minus (--) button. This will delete that partition and erase any data it holds. Finally, drag the bottom-right corner of the remaining partition to the very bottom of the layout pane and click the Apply button. You'll be left with just the single partition, which consumes the entire drive. And no, you won't lose any data from the top partition in the process. 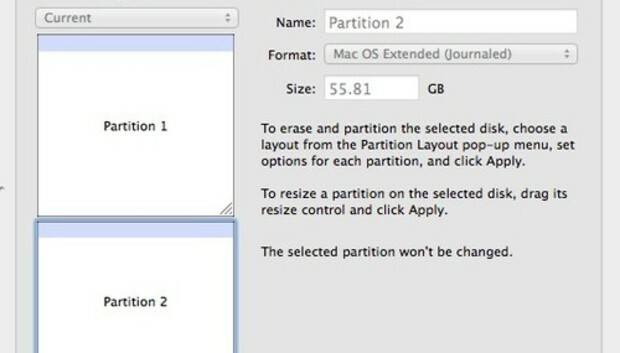 If you've copied data from the second partition to another volume because it didn't fit on the formerly smaller top partition, copy it to the new partition now. Why all the fuss about the position of these partitions? If you want to think of it graphically, using Disk Utility you can only enlarge partitions down. So, in this instance, if you were to delete the top partition you'd be left with a free space hole above the bottom position. Because you can't reposition the partition nor expand it by dragging it up, you're stuck with a load of wasted space.